Trimethylaminuria. Genetics Home Reference. January 2013; http://ghr.nlm.nih.gov/condition=trimethylaminuria. Phillips I, Shephard E. Trimethylaminuria. GeneReviews. April 19, 2011; http://www.ncbi.nlm.nih.gov/books/NBK1103/. 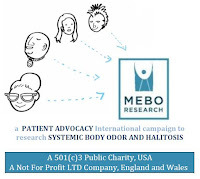 You can also read the 11 posts written on the MEBO Blog under Label, 'TMAU management protocol.' Scroll down to the last one (first posted) and proceed to read the newer posts.